This morning I had the pleasure of co-leading a workshop with Binaebi Akah and Charlene McBride. We had a fantastic group at the workshop, with lots of great participation and questions and most of all, great sketchnoting! I am especially thankful to those folks who brought up their notes to share with the group. What courage and candor and fabulous work. The slides are pretty minimal; the action was in the workshop. But, here they are anyway, both the workshop slides and the “Organizing Sketchnotes” notecards from my portion of Act 2. If there’s something we mentioned that isn’t here, let me know, and I’ll add it. If you’re here with us at MidwestUX, I look forward to meeting you (perhaps again) during the weekend. Say hi! And otherwise, keep sketchnoting and be sure to share your notes with us. Use the #sketchmwux hashtag this weekend, and the #sketchnotes hashtag as you continue to practice. 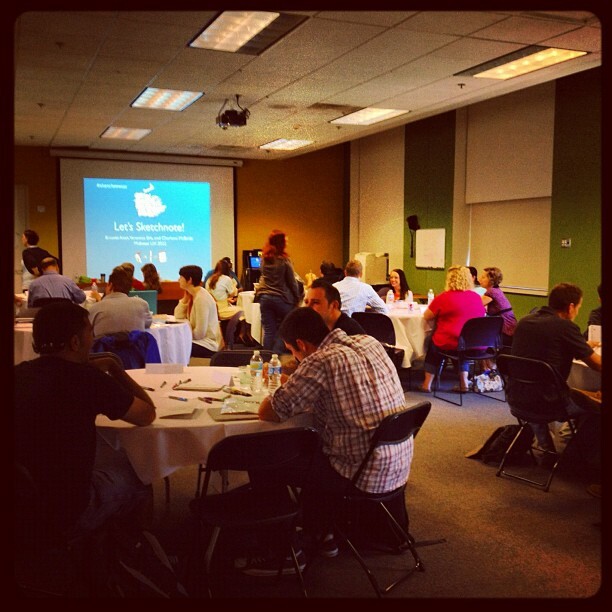 This entry was posted in Events, Summaries and tagged midwestux, mwux12, sketchnotes, workshop. Bookmark the permalink.